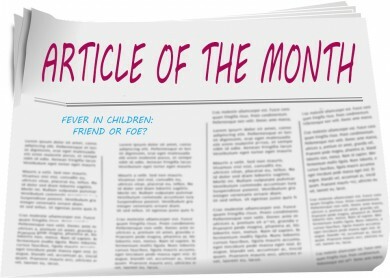 Articles - Fever in Children: Friend or Foe? ABSTRACT: Fever is perhaps the most ancient hallmark of disease. Since the beginning of civilization itself, fever has been regarded as a prime clinical feature of illness. It is the most common symptom in children for which parents seek medical attention. It was Sir William Osler in the early twentieth century who declared that “of the three great scourges of mankind, fever, famine and war, fever is by far the most terrible”. Fever, also known as pyrexia, is a protective defense mechanism the body employs to fight infection. Fever is a anifestation of illness, but not an illness itself. It simply denotes “all is not well” and helps physicians diagnose disease. However, parents consider fever to be an illness and expect it to be controlled at its onset. In fact, very few symptoms worry parents more than a child’s high fever. Physicians also often worry about high fever (over 103ºF) since it can signal a potentially dangerous infection, and treat it aggressively. Nevertheless, it is important to realize that by itself, fever is not a serious illness. Fever almost never kills. It is the cause of fever that may endanger life.